MCF Industries is a provider of precision machined components and assemblies and offer exemplary service and inventory management solutions. Our core competency is the manufacture of shafts and related components that transmit power in various vehicle and industrial applications. Our mission is to understand our customers supply chain needs, apply our vast experience and leverage our processes to provide superior value and innovation to our customers. For over two decades, MCF Industries has been a manufacturer of precision machined parts. 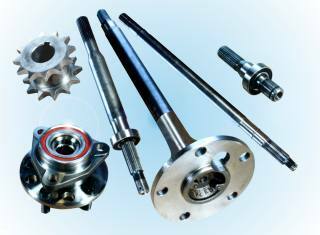 Our primary products are high quality axle shafts, flanged shafts, splined shafts, induction hardened shafts and related components. While our state of the art equipment and process is capable of efficiently handling higher volume runs, we have established a reputation for very effectively handling a wide range of volumes. Whether it is a single prototype part, a small run of service parts, or a large production run, our skilled employees take pride in their work to deliver you quality products. Our processes and services are focused on manufacturing parts and creating supply solutions for the agricultural, off-highway recreational and utility vehicle, mining, and general industrial markets. We strive to build long lasting relationships with our customers and offer unmatched service and technical assistance. We are focused on improving product delivery, performance, reliability and cost to help you compete in today’s competitive and volatile markets.